PoE (Power over Ethernet) technology allows network cable to provide both data and power for the PoE-enabled device. It can provide higher power and reduce a lot of power cables during network. And it has changed the current situation of the wireless network. Well, the PoE powered switch plays a crucial role in the PoE technology. So this article will give a clear explanation to PoE powered switch. What Is PoE Powered Switch? PoE powered switch is a fiber switch with PoE passthrough which has multiple Ethernet ports to connect network segments. 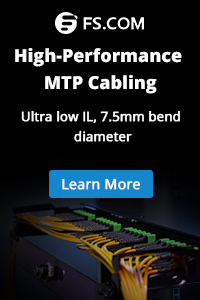 It not only transmits network data but also supplies power via a length of Ethernet network cable, like Cat5 or Cat6. There are two standards for PoE powered ethernet switch. One is 802.3af which provides 15.4 watts of power. The other is 802.3at which provides 25.5 watts. What’s more, most PoE switches offered in the market can provide the speed of 10/100/1000Mbps. And the types of hubs can be classified into 8/12/24/48 port PoE network switch, or unmanaged and managed PoE network switch. 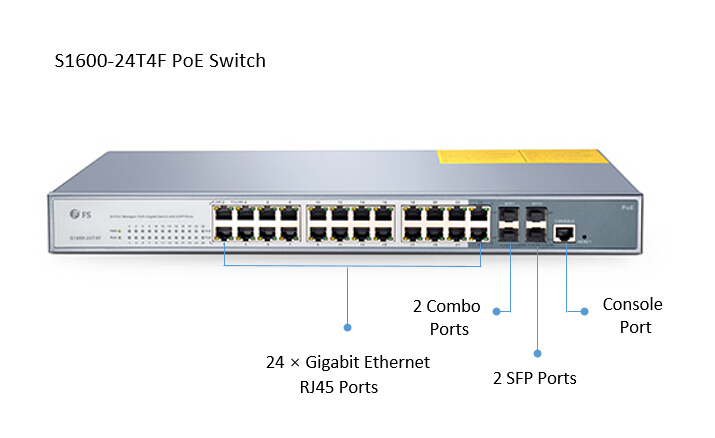 Among the various port designs, the 24 port PoE switch is considered as a decent option for both business and home network. Why Use PoE Powered Switch? The PoE network switch is powered through existing PoE network infrastructure and eliminates the demand for additional electrical wiring. Therefore, you can deploy it without an external power adapter. 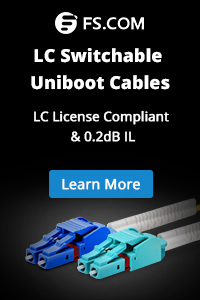 This gives you the flexibility to install the switch exactly wherever you need it. Since PoE power comes from a central source and separates from the data signal rather than a collection of distributed wall adapters. There is no interference of the PoE power transmission and data can be backed up by an uninterruptible power supply. PoE network switch is intelligent and designed to protect network equipment from overload, underpowering, or incorrect installation. It also allows administrators visibility and control. 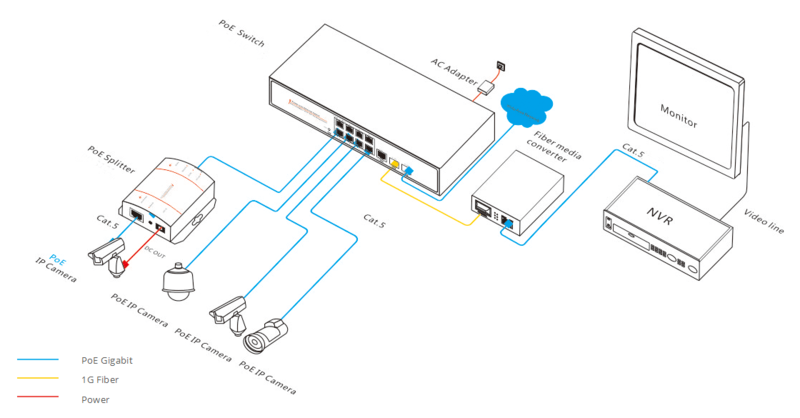 With PoE network switch, there is no need for users to purchase and deploy additional electrical wires and outlets. So it make significant savings on installation and maintenance costs. What Is PoE Powered Switch Used for? PoE is now ubiquitous on networked surveillance cameras. It allows each camera to be controlled remotely from any point in the IP camera systems. Besides, it also enables fast deployment and easy repositioning. VoIP phone is the most common and original PoE application with a single connection to a wall socket. It can be remotely powered down just like with the older analog systems. With PoE powered ethernet switch, only data network cable is required. PoE network switch has facilitated business communication and reduced deployment costs of VoIP. The wireless network is greatly enhanced by the usage of PoE. Data network can be transmitted by running Cat5e or Cat6 network cable from the WAP to the nearest power. And power can be also provided over the same cable. In addition, Wifi, Bluetooth APs, and RFID readers are commonly PoE-compatible. So, these devices allow remote location away from AC outlets, and relocation following site surveys. PoE powered switch works as the heart of a PoE network. It saves both time and money for network deployment and maintenance. FS is a good place to go for the reliable and cheap PoE network switch. If you have any needs, welcome to visit FS.COM. This entry was posted in fiber switch and tagged poe network switch, poe powered ethernet switch, poe powered switch. Bookmark the permalink.